From the author: "Sometimes the history of a nation can be defined by the relationship between two individuals. 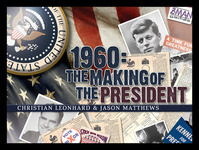 The Election of 1960 is the story of two men, John F. Kennedy and Richard M. Nixon. One is the scion of a wealthy, politically powerful family from New England. The other is the son of a Quaker grocer in Whittier, California. While they belong to opposing political parties, they start out as friends. The complex development of that friendship, however, would shape a pivotal presidential election and cast a long shadow over American history for the remainder of the 20th century.